This PDF 1.3 document has been generated by Microsoft® Word 2010 / http://www.convertapi.com, and has been sent on pdf-archive.com on 26/01/2013 at 06:18, from IP address 50.9.x.x. The current document download page has been viewed 708 times. the highest quality of service and support, but specific results cannot be guaranteed. which your computer can not be repaired. It may have to be rebuilt or upgraded. 1.3 The length of time required to service/repair your computer cannot be predicted. (See par. installed for this purpose will be removed upon completion of the service. be calculated in one hour increments, and carry a minimum one hour charge. services/repairs. Estimates are not guaranteed. authorization to continue or stop at the estimate limit. reached, your decision to continue or stop will be honored by the provider. 3.1 Full payment is due upon purchase of services, upgrades, or repairs. 3.4 A $15 finance charge will be assessed every ten (10) days after the invoice date. 3.5 Returned checks will incur a $25 returned check fee. considered abandoned and become the property of the provider. system(s) for which you request such service(s). subcontractors responsible for the accidental damage. taking into consideration the circumstances and nature of the technical problems. be resolved from the service order, but not resolved. 6.1 All services and repairs are guaranteed for ten (10) days from the invoice date. 6.2 If later found that the service or repair was incorrectly diagnosed by the technician(s). ($100). New parts will be charged to the customer. 7.1 Free Estimates. All repair/service estimates are free. 7.2 For the best approximate estimate, answer all questions to the best of you ability. 7.3 Estimates may change at any time. 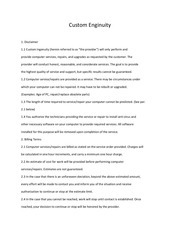 8.1 The customer is responsible for the backup of data on their computer. 8.3 At request of the customer, the provider will back up data for an additional fee. (6) months after the invoice date. 8.6 The provider will not be held responsible for files that are not backed up and lost. 8.7 The provider is in no way responsible for the content of the customers files. This file has been shared by a user of PDF Archive. Document ID: 00071193.